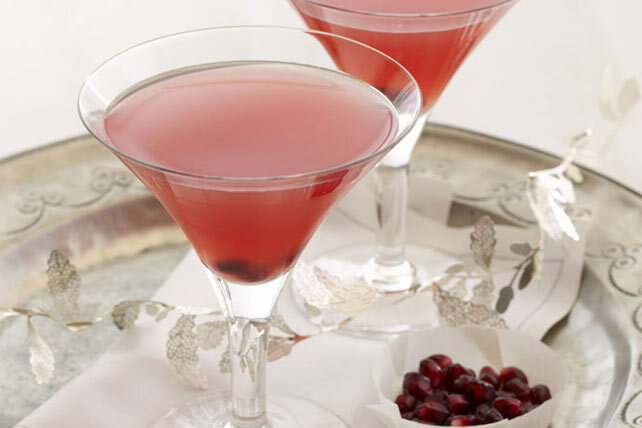 Celebrate Girls' Night—or any night!— with this amazing Pomegranate Cosmopolitan recipe. This Pomegranate Cosmopolitan recipe is fruity, tangy and totally delicious. You won't want to go out when you can drink these tasty beverages at home! Add water to drink mix in 1-1/2-qt. plastic or glass pitcher; stir until mix is dissolved. Place 3 pomegranate seeds in each glass before filling with prepared drink. Substitute club soda for the vodka. Prepare in martini shaker, using 1 pkt. (3.3 g) CRYSTAL LIGHT On The Go Cherry Pomegranate Low Calorie Drink Mix and using 1/4 of all remaining ingredients.